I found some cool glitter transfer paper by Tulip and a cheap $3 t-shirt at my local craft store. This is all I need to make an easy Valentine’s Day Shirt for my boys. 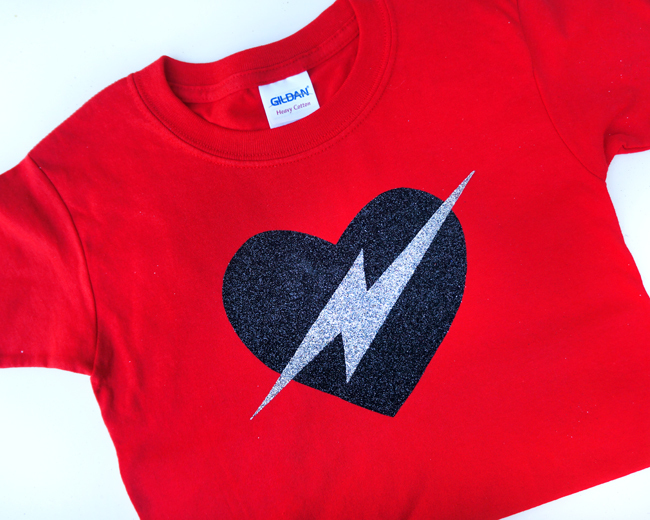 It was my first time using these Tulip Iron-On Glitter Transfer Sheets…but I am officially hooked. I loved working with this stuff, and I loved how my shirts turned out. 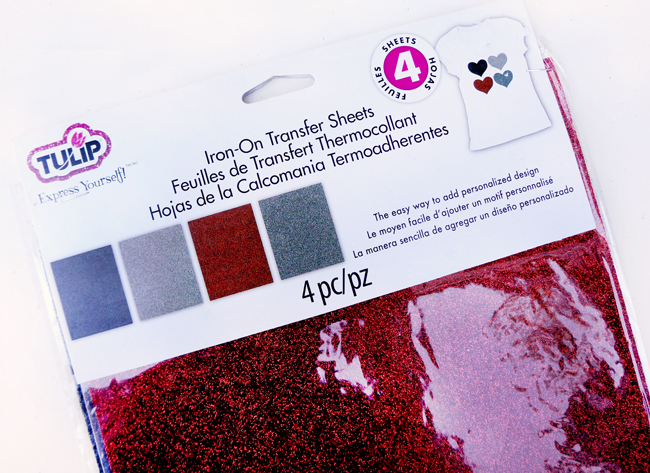 I can think of 20 more things I want to make with this glitter transfer sheets, it’s that cool. And it’s super easy to use. 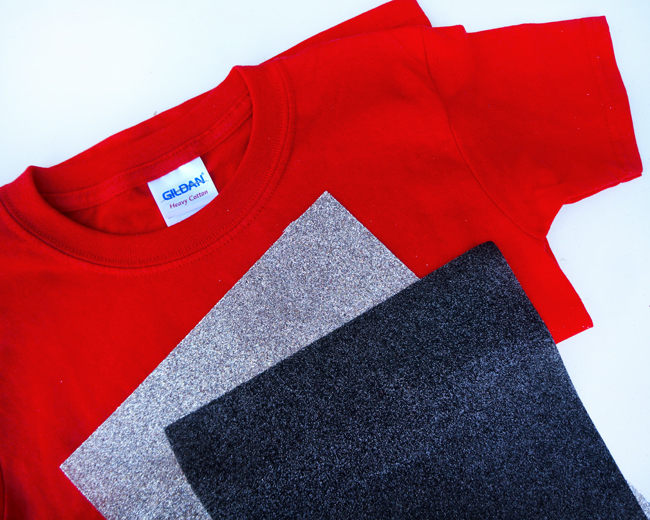 All you do is use scissors to cut out the desired shapes you want, and lay them down, glitter side up on you shirt. Just how you want the finished piece to look. Then, place a piece of thin fabric on top of your design. With a hot iron, iron over the fabric until your design is fused to the shirt. That’s it! 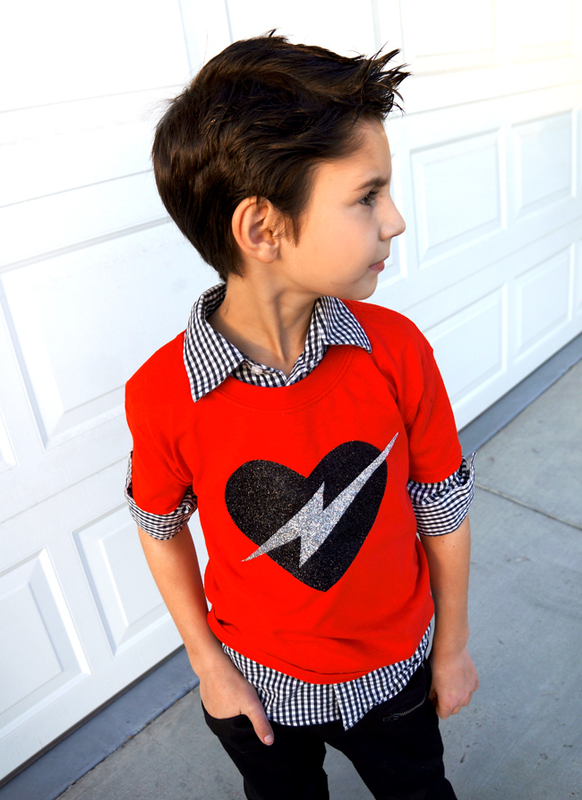 So easy, no sewing and you get a custom design that fits your personality. And the glitter texture is so fun. Tulip also offers metallic, shimmer and hologram sheets, as well as numbers and letters. If you don’t trust your cutting skills or want a more perfect cut, you can use a die cut machine to cut your designs. 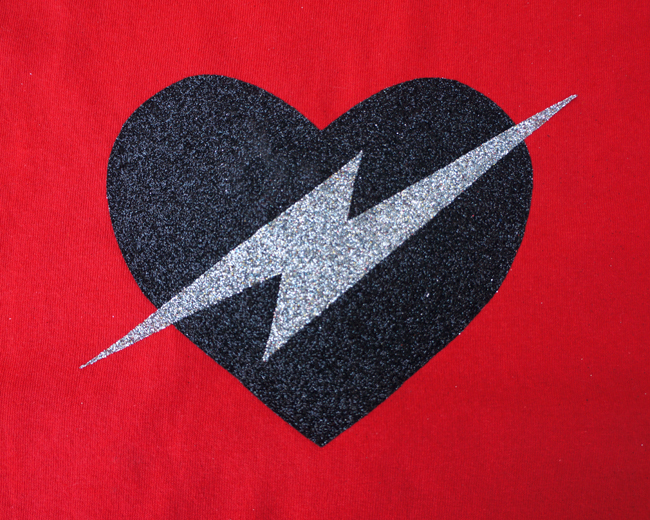 I have included this Valentine Heart and Lightning Bolt template for you to use if you want to make your own Valentine’s Day t-shirts. The whole thing took me 15 minutes to make…less time than it took for me to go to the store. 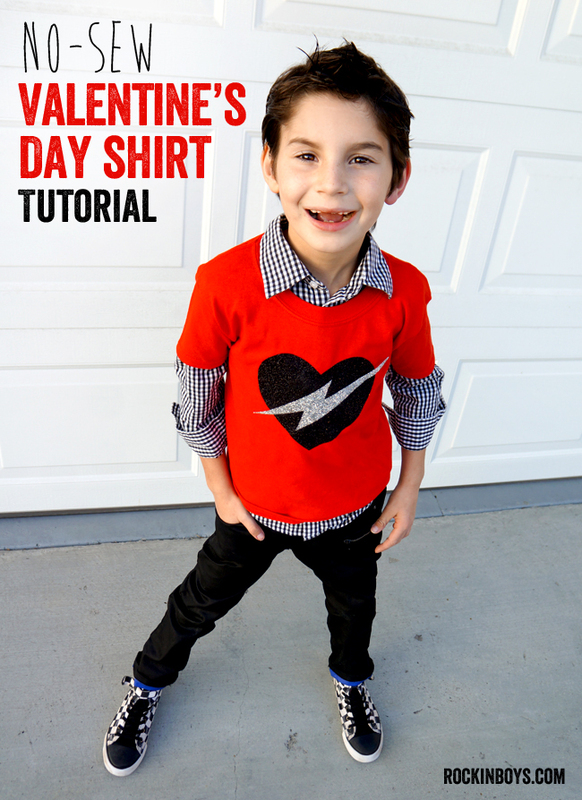 I paired the Valentine’s Day tee I made with a button-up collared shirt and a pair of skinny jeans. 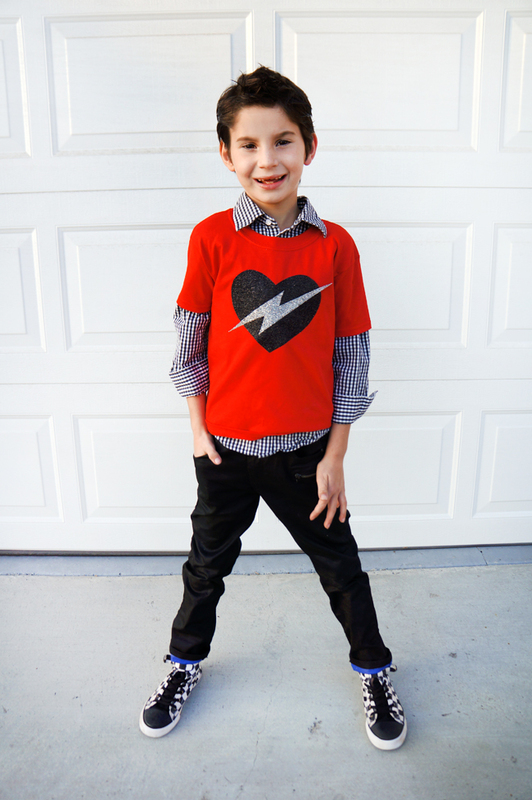 by rolling up the sleeves and leaving the shirt untucked, I have a fun rockin’ Valentine’s Day outfit for my boy. I love how it turned out. Happy Valentine’s Day! I remember when you said you would make these! It looks awesome! Tulip brand has amazing stuff Love the look! That is one rocking shirt! JILL!!!!! I love this!!! Such a great idea!